Adam comes in to check on a booking time with Melanie - he can't read Caroline's handwriting. They have a chat and Melanie tries to coerce Adam into taking her out, but he makes the excuse that Doug's car has broken down and he has to drive him in the limo. Unfortunately for Adam, Doug comes in at that moment and offers him a lift home(!) Melanie is pleased - now Adam can take her out. He reluctantly invites her to go to a movie with him tonight. He says they can meet at the Waterhole, then makes a sharp exit. Christina is sitting crying in the living room when Caroline gets back from the airport. Caroline is oblivious to her twin's emotional state, but presently she notices that Christina is upset. Christina won't tell her why and goes off to her bedroom. Kerry, Amber and Toby are making protest banners about animal fur. Joe is sitting in a corner rolling his eyes. Amber says the march will be just like old times. Amber starts explaining to Toby about how wrong it is to use fur for fashion and goes to show him some graphic photos of mangled animals. Joe and Kerry put a stop to this though. Joe asks if they can take the kids on a picnic on the weekend. Kerry says she'll have to see how long to march takes. Joe isn't impressed. Melanie is telling Caroline how Adam is taking her out on a date. Christina comes out of her room and tells Melanie quietly what happened with Paul - the bracelet was for Caroline. Melanie is horrified that she got the wrong end of the stick. Christina is upset that she's made a fool of herself. Caroline comes in from the kitchen and asks what they're whispering about, but they won't tell her. Amber asks Kerry if she's sick of domestic grind, but Kerry says that she enjoys being married to Joe. Amber says that she's planning to leave after the march tomorrow - Joe resents her being there. Kerry says that Joe is just a bit overwhelmed - he needs time to get to know Amber. Amber says Joe told her she was a bad influence on Kerry. Kerry is upset and says she can think for herself and Amber is very welcome in their house. She'll sort Joe out. Melanie is chatting with Pam and Doug. They get on to the subject of tap-dancing and they say Melanie could give them a demonstration at their house-warming party. Adam comes in and wonders why Melanie has come to the house, rather than meeting him at the Waterhole. Also, she is half an hour early! Caroline tells Christina that they should go out on the town this weekend. Christina says she's not in the mood to go out rages. She starts suggesting clothes and Christina gets cross with her. She tells Caroline to leave her alone. Joe is sick of Amber, but Kerry says he hasn't made an effort with Amber. She says her priorities are different now she's married, but she's still the same person underneath. Joe says he's worried sick about the Earth-watch project and Kerry says that maybe it was a bit ambitious. But she wants to do more with her life than run a house and raise a family. She wants to help make a better world for their kids. Joe knows it's important, but he can't see why Kerry has to go to such extremes. Kerry agrees a deal - she won't go on the trip, if Joe will let her be involved more in the local scene. He agrees. He also agrees to make more of an effort with Amber. Adam and Melanie are having a drink. Adam keeps talking about Caroline and her social life(!) He keeps probing Melanie for details about Caroline. Then he looks at his watch and suggests they head off. Melanie insists on one more drink. Joe, Kerry and Toby are getting ready for the day ahead. Kerry tells Amber that she's decided not to come to the Earth-watch project in Northern Australia with her after all. Amber isn't too impressed, but Kerry says it was her decision. She says she realises now that it would be too difficult with the pregnancy - besides, the family comes first. 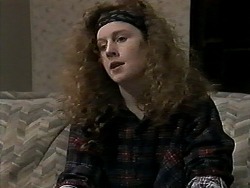 But she will be doing her bit in Erinsborough. Joe awkwardly asks Amber to stay on with them and give things another go. Pam and Doug grill Adam about his date with Melanie - they both like her a lot more than Adam! Adam says Melanie's OK, but she's not for him, and he's not asking her out again. Unfortunately Pam and Doug have offered Melanie use of their washing-machine - and to stay on for dinner too! Adam groans in despair. Melanie is gushing to Caroline about how well she and Adam are getting on(!). Christina comes in and Melanie apologises again about the bracelet thing. Christina still looks very down. Caroline tries to tackle Melanie again about what's bothering Christina, but she busies herself with her work. Toby is waiting on the doorstep when Joe gets home - no-one is home. Joe can't understand where Kerry has got too, but just then Amber rushes up, carrying a crying Sky. There's been a bit of trouble at the protest - there was some fighting at the march. Kerry got caught up in it and has been arrested.